Located in Fort, one of Mumbai’s bustling commercial locations is a restaurant serving seafood in Manglorean & Malvani style. 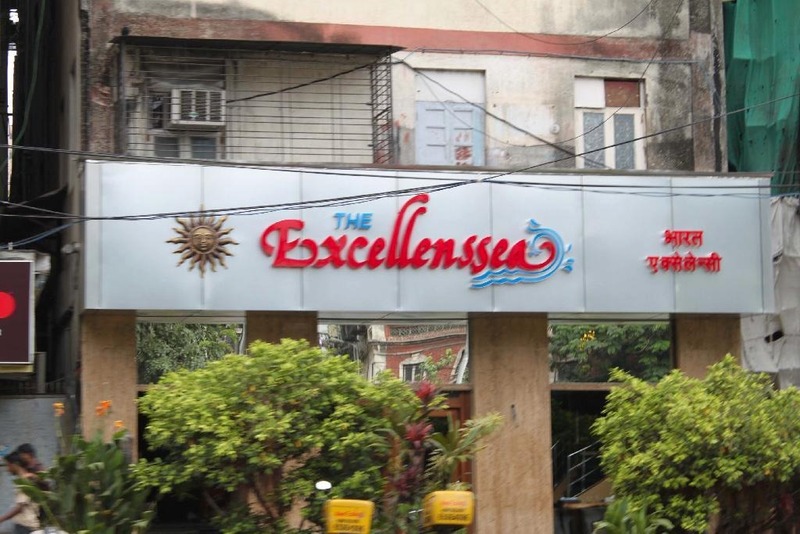 Bharat Excelensea (BE) was one of the first seafood restaurants that I was introduced to as a kid. The whole experience as a kid of actually choosing your meal from the live fresh catch (Crabs, Prawns, Squids, Lobsters and a variety of other seawater Fish) of the day, still brings a smile on my face. But last Sunday was different! While I really liked the new cozier ambiance, I thought the lighting could be a lil bright. According to me, ambiance is something that enhances the eat experience, and this was dull! We finally got our table, but had to wait for the menu for some more time. Don’t ask me if we were served water. Please don’t. 15-20 minutes later when we got the menu, I immediately decided to indulge in BE’s famous ‘Prawn Stuffed Bombil’. After waiting for some time & requesting multiple waiters to take my order, we finally got lucky when the head waiter came to attend us. But he was ‘new’ and didn’t know which fish was available and which wasn’t. For every dish I ordered, he would go to the kitchen to check. When the waiter returned after taking two rounds into the kitchen to first check if they had ‘Prawn Stuffed Bombil’, and then plain ‘Bombil Fry’, I was disappointed and had almost lost my appetite. I had a vegetarian friend with me and hence decided to order the veg dishes first. The waiter started taking our order – ‘Hara Bhara Kebab’, but decided to attend to the people waiting to get their table. Yes, this happened while he was taking our order. The waiter comes back and asks us to wait – “Sir please wait, actually I’m new and don’t know about the available dishes. So, my Boss will take your order!”. When the Boss (the owner of the restaurant) actually came to take an order, again after a good wait, I thought we’ll get our food soon. Assuming that the waiter had already placed an order for the vegetarian starter – Hara Bhara Kebab, I started ordering the Seafood starter and main-course. I went with the restaurant owner’s recommendations and ordered for a Surmai Fry with Neer Dosa & Gassi. I was excited and hungry. We waited for 15 mins. 30 mins. 45 mins. With no sign of food. Groups/families in every table started complaining, some because they’d waited for their food to arrive, so late that a family got rotis when they were done eating their meal. Some because they’d got the wrong dish. By now I was super disappointed and furious and asked the waiter to atleast get the veg starter. He was startled and asked me “Are you placing the order now or did you place an order with my Boss earlier?”. This was it and we decided to walk off from the restaurant. I was initially very hesitant, thinking that waiters would come and stop us and that would get embarrassing for us, but no one cared! On one hand there are new restaurants like Pa Pa Ya (Lower Parel) giving so much importance to customer experience or even not too expensive Thali places like Panchvati Gaurav (By the way, that’s where I ended up eating a superb lunch after walking out of BE) who make you happy & satisfied about indulging in Indian food, and on the other hand there are experiences such as these. While I’ve always believed that Mumbai is on its way to becoming a ‘Good Food Central’, with this kind of experience at one of Mumbai’s oldest restaurants brings me to a critical question – How important is ‘customer service’ in the Indian f&b space? Tell me what you feel in the comments below. ← Trailer Review: Dilwale – Too much happening on screen, but hits you on the right places! The thing is that once we experience excellent service from any place, we expect them to live up to that reputation. Personally, after going to a five star restaurant, it took me a whike to step down from the experience. Every time i entered a normal class restaurant, i tended to compare both the experiences. But my friend found the normal restaurant excellent, even though i was noticing everything from the waiter’s body language to the fact that he didn’t change my cutlery after the starters. I guess experience is subjective. Some may not mind or care.. some of us tend to judge on previous experiences. Rest act up downright offended for nothing. But i do agree that customer service should always be upto the mark. Minimum courtesy should be grounded into all those in the service industry.